Where can I find the track files for my GPS unit? Modern Garmin devices like the Forerunner 920XT and 620 mount as a drive when connected to a computer via the USB cable. Inside this drive is a folder called “GARMIN” and underneath that is a folder called “ACTIVITIES.” This folder should contain every activity currently in the device’s history in the form of a .FIT file. It is recommended that these files be copied to a location on the local hard drive before importing into RunParticles so that they will be available after the device is disconnected. If you’re using the Garmin ANT Agent or Garmin Communicator Plugin to upload your activities, refer to this support article on where to find your activity files. Can I download my activities from Strava or Garmin Connect? This method of obtaining track files is possible but not recommended. Strava provides a bulk export feature to download all of your activities in GPX format. This is fine if you only ever run or bike, but if you do both the resulting GPX files have no way of recording the sport so RunParticles won’t be able to distinguish between a bike ride, a swim, or a run activity. Garmin Connect does not provide any sort of bulk download feature that I’m aware of. There are sites that purport to do this like this one but I have not tested this and I cannot vouch for its effectiveness. The best way to get tracks into RunParticles is to download them from the raw .FIT or .TCX files saved by your device itself. 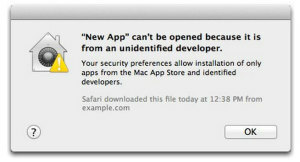 This is a security feature implemented in Mountain Lion called GateKeeper. You can bypass it by holding down the Control Key when clicking the RunParticles icon and clicking “Open.” You should only need to do this the very first time you run RunParticles.